Spring Cleaning Kit KMAXSCK Pack of 1 "Spring Cleaning Kit. Contains cleaning cloths, rubber gloves, duster, scourer and a selection of fluid cleaners to clean and freshen the home or office hygienically." Drain Cleaning Kit 12 Piece 313790 Pack of 1 "Kit to equip the user with a variety of drain blockage and cleaning utensils. Rods are made from polypropylene with brass end connections. 9m long when fully assembled. Includes 10 x 915mm long rods, double worm screw & plunger. Non returnable." 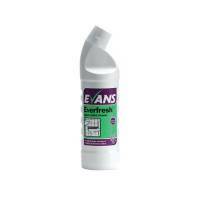 Evans Everfresh Apple Toilet Cleaner 1 Litre A103AEV Pack of 1 "Versatile washroom cleaner. 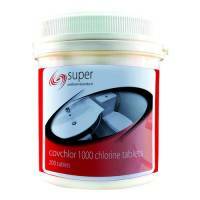 Thickened formula cleans toilet bowls, urinals, sinks and washroom surfaces. Fresh apple scent. Suitable for porcelain, stainless steel, chrome, ceramic tiles and more. 1 litre bottle with angled nozzle." 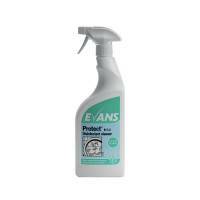 Evans Protect Disinfectant Cleaner 5 Litre A125EEV2 Pack of 1 "2-in-1 cleaner and disinfectant. Ideal for schools, hospitals, nursing homes and sports clubs. Helps to prevent cross contamination. 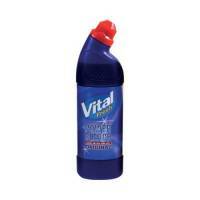 Concentrated 1 litre bottle for economical use." 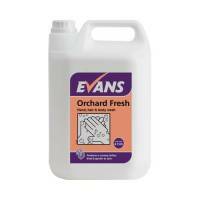 Evans Orchard Fresh Hand and Body Wash and Shampoo 5 Litre A153EEV2 Pack of 1 "Bulk pack of liquid soap for hands, hair and body. Produces a creamy lather. Moisturiser is kind to skin. Citrus fragrance. Ideal for wall-mounted or free-standing dispensers. 5 litre bottle." 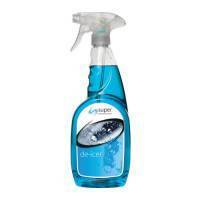 Evans Toilet Cleaner and Descaler 1 Litre A190CEV Pack of 1 Powerful toilet cleaner and descaler. Use to remove limescale and soiling from porcelain and stainless steel. Pine scent removes bad odours. 1 litre bottle with angled nozzle. 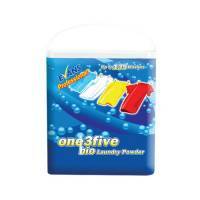 Evans One3Five Bio Laundry Powder 10kg C050AEV Pack of 1 Evans One3Five Biological Laundry Powder for professional use. Excellent results at all temperatures and in all water conditions. Oxygen based bleach and enzymes for effective stain removal. 10kg pack last up to 135 washes. 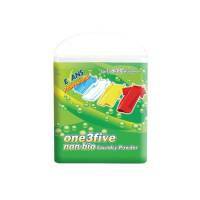 Evans One3Five Non-Biological Laundry Powder 10kg C049AEV Pack of 1 Evans One3Five Non-Biological Laundry Powder for professional use. Excellent results at all temperatures and in all water conditions. Oxygen based bleach and enzymes for effective stain removal. 10kg pack last up to 135 washes. 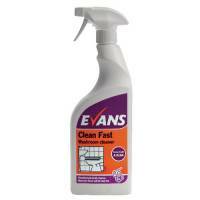 Evans Clean Fast Heavy Duty Washroom Cleaner Spray Bottle 750ml (Pack of 6) A010AEV Pack of 1 "Heavy duty cleaner for washrooms. Foaming application for increased contact to surfaces. Removes limescale and soiling effortlessly. Tangerine perfume for long-lasting freshness. Use on basins, baths, showers, toilets and surfaces." 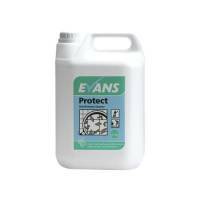 Evans Protect Ready-to-Use Disinfectant Cleaner 750ml (Pack of 6) A147AEV Pack of 1 "2-in-1 cleaner and disinfectant. Ideal for schools, hospitals, nursing homes and sports clubs. Helps to prevent cross contamination. 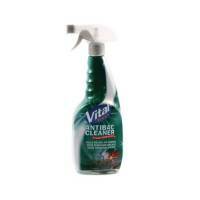 Pack of 6 ready to use 750ml spray bottles." 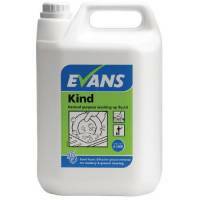 Evans Kind General Purpose Washing Up Liquid 5 Litre (Pack of 2) A180EEV2 Pack of 1 "Removes grease and soil easily. Foams well in hard and soft water. Light lemon-fresh fragrance. Ideal for crockery, glassware and utensils. Also great for washing cars and hard surfaces. Concentrated formula for long-lasting use. 2 x 5L bottles." Evans Versatile Hard Surface Cleaner 5 litre (Pack of 2) A018EEV2 Pack of 1 "Effective cleaner and degreaser for hard surfaces. Cleans heavily soiled floors and surfaces quickly. Ideal for professional use as an all-purpose cleaner. Clean and fresh ocean fragrance. Can be mopped, wiped or used with a high speed floor machine." Antibacterial Soap 250ml 604246 Pack of 1 Kills bacteria and microbes. Leaves your hands feeling fresh and clean. Suitable for all skin types and ages. Supplied in a handy pump dispenser ensuring the correct amount of soap each time250ml. Pack of 1. Non returnable. Blue Centrefeed Roll 2 Ply 150m (Pack of 6) KMAT6238 Pack of 1 Centre-feed hand towel roll for dispensers. Blue colouring ideal for catering use. Quality two-ply tissue. Designed for centre-feed dispensers. Pack of 6x 150 metre rolls. 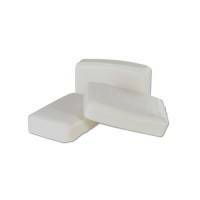 Buttermilk Soap Bars 70g Pk72 NWT378 Pack of 1 Lightly fragranced buttermilk soap bars. Ideal for hotels and hospitality. 70g per bar. Pack of 72 bars. Suitable for all washrooms. Scotchgard Fabric and Upholstery Cleaner 467g 1014R Pack of 1 Scotchgard Fabric and Upholstery Cleaner 467g 1014R. Deep foaming action for tough stains. Protects against future staining. Ideal for large areas including curtains and sofas. Aerosol can for easy application. Chemtab Effervescent Chlorine Tablets VCHECT (Pack of 200) Pack of 1 Chlorine tablets for effective cleaning and disinfection. 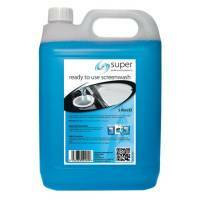 Solid NaDCC tablets: safer and more convenient than liquid bleach. 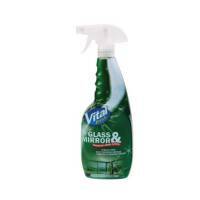 Kills virtually all known microbes. Tub of 200x 3.25g tablets.